Downtown Pensacola Historic home in North Hill. Sleeps 4-6! No cleaning fee! This cozy home was built in the 1920's, and totally remodeled and renovated in 2007. The kitchen is large and fully equipped, the dining room seats up to 10 and lends itself well to small parties that often flow out through the kitchen to the back patio. 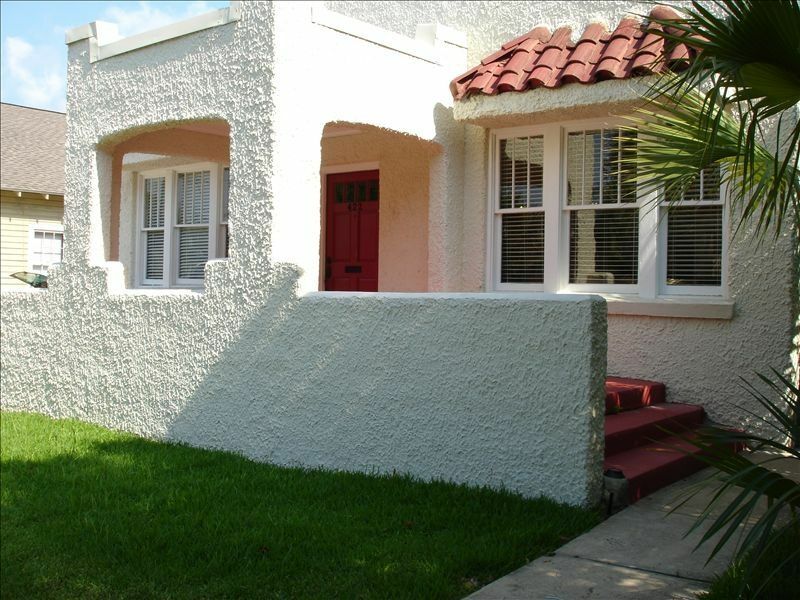 The house is close to the hub of activities in Pensacola, and only 20 minutes from the beach without traffic. Festivals, night clubs, churches, restaurants, the harbor, Wahoo's stadium, the Saenger and Pensacola Little theater are downtown, and the eclectic downtown is always bustling with activities. There is a market every Saturday on Palafox. There are shops and restaurants all along Palafox. The shops begin less than one mile from the house. We walk down all the time, with our neighbors, but we have noticed that our customers are not accustomed to walking . If you would rather take an Uber to get to the shops, it is about a $5 ride. Parking downtown is also easy, unless there are many events going on at one time. I dont believe you can get a house closer to the downtown area. The neighborhood is filled with big homes, bungalows and cute shotgun houses mixed with businesses. The downtown is going through a revival, and many houses here have been fixed up over the years, and there are even some new houses being built. The lot across the street has just been bought and a house is starting to be built there. It is so nice to see people taking an interest in the historic district again! There is a really nice park right next to the house, where children can play. The basement fitness room has balls, bands, a punching bag, two pieces of equipment and a large rocking horse for fun. There is an outdoor shower and changing area to enjoy on warm days. In the basement we keep 2 small cots that could accomodate two small children if necessary. The beds are very comfortable. The master bedroom has a queen size bed, and a small, private, sitting room/TV room with a pull out bed for 1. The second bedroom has the 2 twin beds and also houses the Internet connection and a TV. The livingroom has a pull out couch, if needed, and there are 2 cots in the basement. If you have more than 4 people, the extras will have to sleep on the pull out or the cots. Though the house is not suitable for very small children, those over 6 will enjoy the basement and the huge rocking horse in the basement. My daughter, Susanna, manages the property, and lives right around the corner, if you have questions. Towels, sheets, pillows and blankets are provided, as well as dish and laundry soap. Please put down the correct amount of people. If there are more than 4, I have to plan cleaning accordingly. All payments are through a credit card, through VRBO. Please, no groups under 25 years old. Brand new air conditioner!! There is plenty of street parking in front of the house. The city came and fixed the sidewalks, at the driveway, so there is a slight rise that very low cars may hit. Please park on the street if you are unsure. There is enough parking for about 6 cars. Please don't park on the grass. My family and I have lived in the North Hill Historic district for 3 generations. Recently my husband and I moved to a subdivision a little farther from downtown. We love to spend special weekends at the De Soto Street house especially if we have attended an event downtown or at the Sanger Theatre. Every few months we like to have a little mini vacation at the house so that we can relax and stroll around the neighborhood, go the the Naval Air Museum which changes often, and then have Sunday brunch downtown or at the Hilton on the beach. My daughter Susanna often meets the guests who rent the house and helps out since she lives close. We love the historic district for walking and enjoying the homes and flowers. But actually, the house has been in the family for a long time. It became run down and my family, my husband, many others, and I totally redid the old place, every inch. It is close to all our daily activities too. It is fun to have our family parties at the De Soto Street House because there is always something for everybody to do there, walk the neighborhood, go to the park, skateboard, cook, sit out in the back under the palm trees, play in the basement. My mother loves to come because she holds court in the living room from her favorite rocking chair. Everybody else mosies around mixing and mingeling. It seems an easy place for everyone to just be. We love the outside shower. It has the privacy of a fence and bamboo plus hot and cold water and a bench. We use All Free And Clear and bleach on the blankets, towels and sheets. The kitchen has many spices and staple items for cooking and baking. The totally new kitchen is equipt for entertaining with plenty of dishes, glasses, wine glasses, pots, hand mixer, serving dishes, punch bowl, hors d'oeuvre plates and more. There is a TV in the second bedroom and another in the private sitting room off the master bedroom. This area is paved and shaded by huge palm trees. Folding lawn chairs are in storage area. Basement fitness room, private sitting room off master bedroom, outside hot and cold shower and dressing area, comfortable well lighted reading areas, most items needed for entertaining such as many dishes, a 30 cup coffee pot, glasses. Punch bowl and party supplies available such as many dishes, wine glasses, etc. There are two leaves for the dining room table. We thoroughly enjoyed our three week stay in this comfortable and cozy rental. The home has everything needed for a stay away from home including some kitchen basics and spices. We loved the location and did walk to the downtown area. It is just a short drive to the beach which we enjoyed a couple of times. Our little guy enjoyed the beach toys while we enjoyed the beach chairs. Much appreciation to the owners for their help in sharing their home so we could enjoy time with our son and granddaughter! Nice comfortable house in quiet and pleasant surroundings and friendly neighbours. House fitted out with all necessary mod cons. Cute house Downtown and close to everything. Had a great time and look forward to staying here again. Very cute, clean, and cozy house. Plenty of space and sleeping accommodations for 5 adults. Close and convenient to the beach (about 15 minutes). Would definitely stay there again!! North Hill is a beautiful historic neighborhood with many restored turn of the century (20th) homes. It is a good place for long walks and running. A neighborhood park is only 1/2 block from the house. Downtown is within walking distance and has many restaurants, museums, entertainments, and our newly restored and remodeled Sanger theater. Oportunities for deep sea fishing, sailing, and other beach activities abound in the Pensacola area.